No one was more surprised that Ray Cortines became the latest LA Unified superintendent than Ray Cortines. 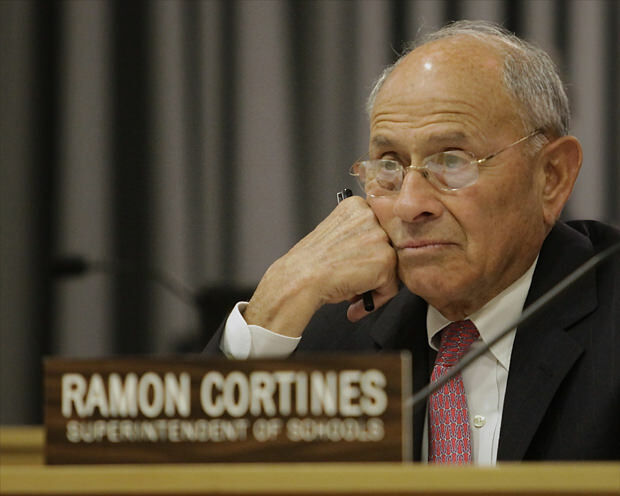 Cortines, 82, a former school district leader in New York, San Francisco, Pasadena and twice before in Los Angeles, was named today as the interim replacement for the resigning John Deasy — the result of a unanimous vote by the board to bring him back. He served as LA Unified superintendent briefly in 2000, then again from 2009 to 2011, when he retired and one of the deputies he hired, Deasy, succeeded him. What Deasy leaves to his former mentor is a district with improving student academic metrics but also whirlwinds of problems, not least a teachers union, UTLA, that had a balky relationship with the district under Deasy. These days, the difference in their bargaining positions for a raise in teacher salaries amounts to $188 million a year. Cortines said he’s ready to jump in, already with plans for two meetings on Monday, his first official day on the job: a session with the district’s labor negotiating team, followed by a meeting with the union’s counterpart. For all the care he has for employees, he also has the same budget that Deasy had, which leaves open questions about how quickly, if at all, he can satisfy the union’s salary demands. The union has threatened to strike over salaries and a range of other issues. On the issue of iPads for all LA Unified students, the one issue that probably caused Deasy more problems than any other in recent months, Cortines said the devices were only “a tool in the learning process” and that he favored a more studied approach for how they might be utilized among various age groups. That appeared to be a missing element of the plan under Deasy, who wanted to assure that all 650,000 LA Unified students had one. As for his relations with the current board, Cortines predicted that he and the members might not always agree on every issue.